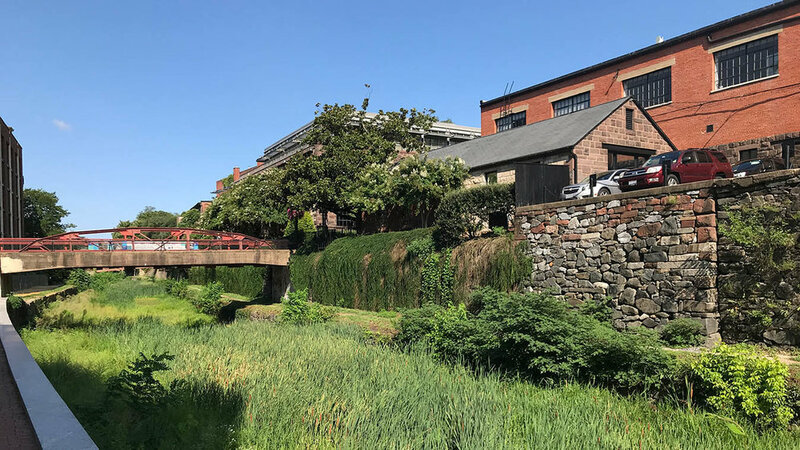 McMullan, with its own multidisciplinary team, is spearheading the comprehensive infrastructure assessment that is being executed in parallel to the Georgetown Canal Plan. The C&O Canal within Georgetown has been subject to continued deferred maintenance; discontinuous repairs have occurred over time, and many restoration and construction records are incomplete. Invasive vegetation, in addition to intermittent flooding, has weakened the C&O Canal’s infrastructure and foundations over the past nearly 200 years. Thus, the purpose of this comprehensive infrastructural assessment is to gain a full and comprehensive understanding of existing conditions and structural stability of the Canal. It has been assumed that failing and unstable Canal walls will need to be reconstructed, repaired, and repointed as appropriate, and where necessary, and the Canal’s Clay-liner may also need to be repaired. In addition, much of the Canal resides within flood-plains and will undoubtedly be subject to an increase in frequent flooding. Findings of our assessment will inform the needs, priorities, and costs to ensure the Canal’s structural integrity is stable enough to withstand the shocks and stresses of future climate catastrophic events, enabling the Canal to permanently hold water for the next 50-100 years. It is also desired that the end state of the Canal will have four operating locks and water retained to a depth of six feet in each level. The constant water flow and depth will be controlled through the lock gate paddles and scum gutters.